I’m heading out to CA for the week. So much to do before the flight. Laundry. Packing. Paperwork… the list goes on. But what have I been fussing about? Making a crochet caddy for myself so I can craft in comfort on the plane ride across the country. Make the caddy? Or do my chores? Guess what I chose to do? Ha. As if there was ever any real question. 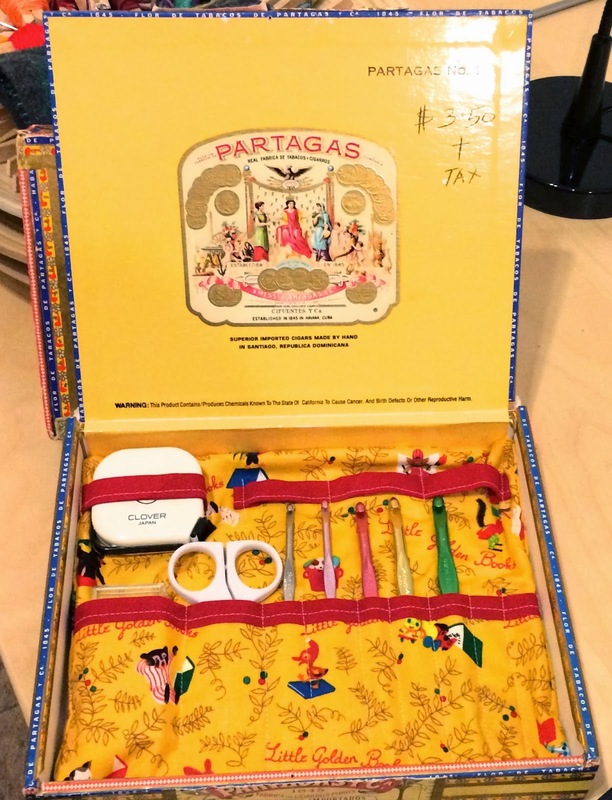 I chose to use this pretty cigar box for my crochet caddy. I’ve heard lots of people oohing and aahing over “rolls,” but I prefer my supplies contained in boxes. I think it looks neater, packs well and can be stored in visually pleasing stacks. 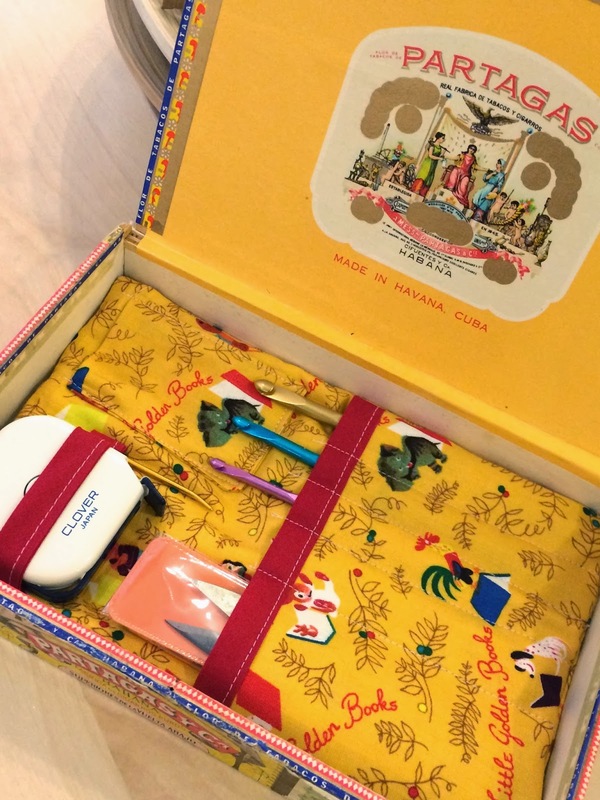 I’m envisioning one cigar box caddy for my embroidery supplies, another one for my hand sewing kit and yet one more for cards and letter writing. Trace the bottom of box/tray onto a piece of pattern paper. Add a quarter inch seam allowance around rectangle. Use pattern to cut 3 pieces of fabric. Two pieces will form front & back of caddy insert. The third piece is used to make the pocket. Use pattern to cut 1 piece of batting. To make the pocket: Press the third piece of fabric in half. Sandwich binding across the folded seam and sew across. Layer pocket piece, fabric rectangle, batting rectangle. You should be looking at all right sides of fabrics. Pin where seams should go to partition big pocket into a series of smaller pockets. Sew. 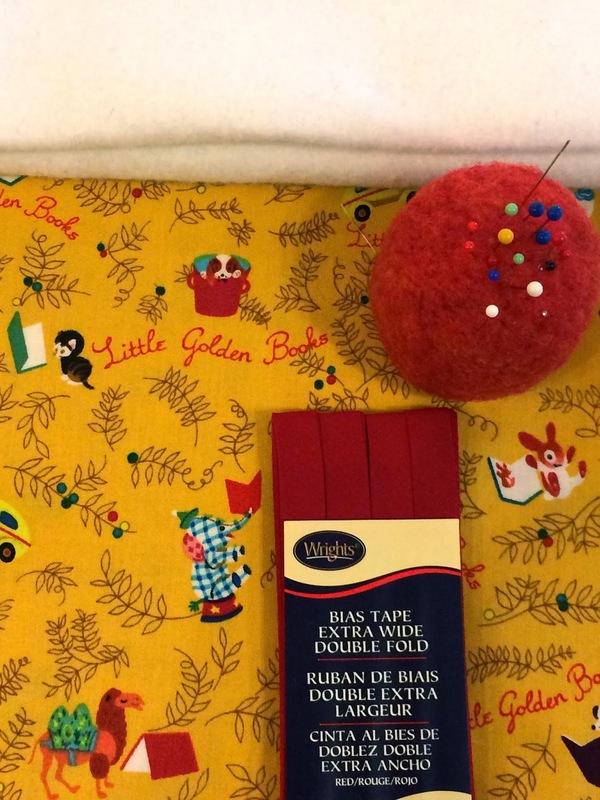 Add either smaller pockets, loops of binding or loops of elastic to hold small boxes, measuring tapes or misc. supplies. This forms the front of the caddy insert. Pin front and back sides of caddy insert together – right sides facing in. Sew together leaving a small seam open to flip right sides out. I used a quarter inch seam allowance. Trim excess batting off sides and corners. And voila – beautiful little caddy all ready to be loaded with crafting goodies. Here’s the one I made for myself. Can’t wait to break it out on the plane tomorrow. And because I had an extra box and I’m still loving this fabric, here’s the one I made to sell as a crochet kit at my shop. I love it. Wonder if anyone else will?